Seeing how things unfolded for Italians Lahmia with their first full-length Into the Abyss, I could not have been any more prophetic after the review of their demo Forget Every Sunrise. At the time I recall feeling talent from this Rome collective and did happen to enjoy their formula for melodic death metal. It was very much Dark Tranquillity based, and every one on this zine knows that if there is any band out there of which I am a die-hard fan it is these Swedes. While I was suggesting Cruz del Sur, it is another Italian label Scarlet/BakerTeam Records which gave Lahmia a chance, and I am sure the label has to be happy with the results. 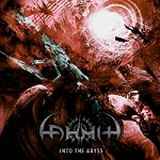 Continuing to show the talent, the band dipped further into the melancholic corridors of the aforementioned melodic death algorithm, and secured a perfect team to record it with. The guys like Guiseppe Orlando (Novembre) and Jens Bogren (producer of many notable Swedish outfits) know how to coax a sound both forceful and gloomy, and that is what Into the Abyss sounds like. Perhaps I have listened to every Dark Tranquillity nook and cranny for too many times to feel references to them even when they might not be there, yet I hear them aplenty on Into the Abyss. From the quick beatdown to blasts to double bass, from steady melodic gallops to more frantic Swede-thrash, from the growly singing by Francesco Amerise which spills his guts out to his inevitable clean vocals – I hear Lahmia touching on a lot of things Dark Tranquillity has done, from Zodijackyl Light to Fiction. The inflections in the minor chords and mid-part introspection (Silent through the Screaming Crowd), the outright catchiness and taking a quick pause before plunging into the main riff (title track), the stretchy sing-along nature of Grinding Dreams reminding me of Hedon – the songwriting elements similar to Dark Tranquillity are also on display here. The flow, the might and the convincing nature of the Lahmia wall of sound is something else why the album won me over. Not to give you an impression that we are dealing with a plain copycat, Lahmia does not lift riffs or melodic passages from their Northern European influences, at least I did not hear them, so the melodies are their own visions and projections. Their solos have a lot more shred and progressive flavor. The clean vocals by Francesco also sound lower than Mikael Stanne’s. Most importantly Into the Abyss is a very even and equally strong album without a weak throwout track. The Italians do fast numbers where they go after things (Strength from My Wounds) just as well as they do slower, swaying songs (Glass Eyed Child), where comparison with Insomnium is more appropriate. They also try experimenting, but then I have to say again, just like Dark Tranquillity, Lahmia experimentation is in the realm of things gothic/blackened/doomdeathy on My Crown. I re-read my review several times now, and I am hopeful people won’t dismiss Lahmia on account of my Dark Tranquillity comparisons. The Italians are certainly not inventing their own genre, and are dipping into a pool very well populated, but I am still convinced about the quality of their delivery now as I was when I reviewed Forget Every Sunrise. My conviction in and of itself should not be the selling point for Into the Abyss, but if you are a melodic death metal fan, you will find a lot to like on the album and, perhaps, won’t be turned off by the lack of originality. As many people said many times on these pages and others – not so original things done well have their right under the sun. It is the “done well” part which counts and Lahmia delivers in that department.